Patient Zero asks the intriguing question: If George A. Romero's Day of the Dead (1985) were re-imagined as a sequel to 28 Days Later and World War Z, wouldn't that be interesting? The answer, unfortunately, is a resounding: NO. Like Day of the Dead, Patient Zero is set in a nuclear silo, where the remnants of humanity seek shelter from the Zombie Apocalypse, while scientists and soldiers argue about the best way to deal with the situation. Wait - did we say "zombie"? Actually, the "Infected" in this film are living humans driven by an uncontrollable "rage" virus, as in 28 Days Later, and the scientists need to find the elusive "Patient Zero" (as in World War Z) in order to engineer an effective vaccine. To that end, the military has been capturing the Infected for interrogation by Morgan (Matt Smith), who can speak the Infected's "language" because he has been bitten but not turned. Why and how do the Infected have their own language? If Morgan is immune to the virus, why don't the scientists focus all their efforts on using him to find a cure instead of wasting time searching for Patient Zero? As in Day of the Dead, soldiers and scientists are at each other's throats. Mike Le's script never answers these questions. In the case of Question #1, I suspect the original concept was that Morgan was on the same wavelength as the Infected, able to audibly decipher their raged-filled howls and raving, but that this was considered too hard to explain, so the concept was simplified to "he speaks their language." Presumably, this element was included to give Morgan something important to do, since he is neither scientist nor soldier. Unfortunately, it leads to a risible moment when a hot-headed military man (Clive Standen) threatens to shoot Morgan, dismissively asserting, "There's a thousand more like you." Really? A thousand more people immune to the virus? Then where are they, and why aren't they donating their blood to help find a cure? Which leads us to Question #2. There is one small experiment in which Morgan's blood is used to mitigate symptoms in one of the Infected, but Dr. Rose (Natalie Dormer) insists the effects are temporary. Why she puts less faith in a cure derived from Morgan than on a vaccine derived from Patient Zero is not completely clear; the film simply assumes that finding Patient Zero is necessary, because otherwise there is no plot. There are a few problems with this. First, the notion that "Patient Zero" is necessary to develop a vaccine is a fabrication popularized by World War Z (Jonas Salk did not need a Patient Zero to eradicate polio.) Also, the script evinces the usual confusion about the distinction between cures and vaccinations, the latter of which are used to prevent diseases not cure them. In a world where the vast majority of the population is already infected, a cure would be much more valuable than a vaccine. From this muddled set up, Patient Zero has difficulty generating any energy; in fact, it can barely generate enough scenes to reach feature-length. The action consists mostly of Morgan interviewing the Infected, interspersed with numerous un-involving flashbacks to life before the virus - scenes that pad the running time without telling us anything we need to know. Thing pick up a bit when The Professor (Stanley Tucci) arrives. Before being bitten, he was a philosophy professor; now he is leader of a new, smarter breed of Infected that is evolving. Like Hannibal Lecter, The Professor seems completely aware of and completely unapologetic about his homicidal impulses; in fact, he sees himself and his brethren as superior to humans - the next step in evolution, which will wipe the "disease" of humanity from the face of the Earth. The cat-and-mouse dialogue between Morgan and The Professor suggests there is a good short horror film buried inside Patient Zero's tedious running time, but even this falls to pieces when (like the Joker in The Dark Knight) it turns out the Professor's capture was part of his plan, which includes a captive underling with an electronic device surgically embedded in his body. Surprise - it's a homing beacon leading the Infected to the hidden silo! Actually not so surprising. As in Romeros' Day of the Dead, the third act of Patient Zero consists of the silo being overrun. The difference is that Day of the Dead had really reached a third-act crisis point by the time the zombies invaded; Patient Zero still feels like it's mid-film because so little has happened. The ensuing chaos generates zero thrills because, frankly, the film has been absolutely unable to engage us in the situation or build tension to the point where the events feel like a climax. Consequently, the ensuing massacre of humanity is so much empty noise. (Also, is it really possible for the Infected to get in simply by climbing down into the missile silo? Isn't there a locked door somewhere? And why should we care if the filmmakers do not? According to the closing credits, Patient Zero was partially shot on Shepperton Studios in England. Which raises the question of why the film tries to pass itself off as American. The question is not an idle one; it hurts the film terribly. Matt Smith is an excellent actor, but his American accent seems awkward coming out of his mouth. It's like a restraint tethering his best instincts; he never breaks free of it, so what we see on screen is hollow, the emotion buried somewhere out of reach. Tucci at least has some fun in the film's most intriguing role, playing a variation on the archetype of the Evil Philosopher (as seen in such films as Seven, The Dark Knight, and Manhunter). It's one thing to confront a mindless, inarticulate rage-monster; it's far more disturbing to confront a mindful, articulate rage-monster who is self-aware and even proud of his nature. To that end, Tucci delivers his choice dialogue with a condescending smirk that's actually in character - not the actor commenting on the lousy movie he's trapped in. Tucci's performance brings out the best in Smith, who manages to rise at least partly to the occasion, generating the film's few interesting moments. Sadly, the dramatic conflict between the two characters is short-circuited by the arbitrary "all hell breaks loose" ending. Instead, we're left with Smith delivering a Doctor Who-type speech on the resiliency of the human race in the face of adversity, as Morgan and Rose ride off into the moonlight in search of sequels that will never materialize. In case the parallels with Day of the Dead were not clear enough, Patient Zero also includes a sequence in which a human is bitten on the arm, which is quickly amputated in a failed attempt to prevent the virus from infecting its host. It's not a bad scene, but it contributes little to the film as a whole. Splicing in DNA from older horror movies is not in and of itself a crime against cinema, but the resulting creation needs to synthesize into its own organism; too often, Patient Zero stumble around like a Frankenstein monster of ill-fitting pieces randomly stitched together. Patient Zero features some good production value and a decent score; the trailer actually looks good, which suggests there was at least some potential for the film itself. Unfortunately, the best thing one can say about this cinematic disappointment is that it's bad in a very forthright way. From the very beginning, the dialogue, performances, and pacing are so flat - like watching a rough cut of filmed rehearsals - that the filmmakers seems to be deliberately announcing: "If you sit through more than five minutes of this, you have only yourself to blame." Fortunately, if you stick around for Tucci, your time will not be completely wasted, but nor will it be well spent. 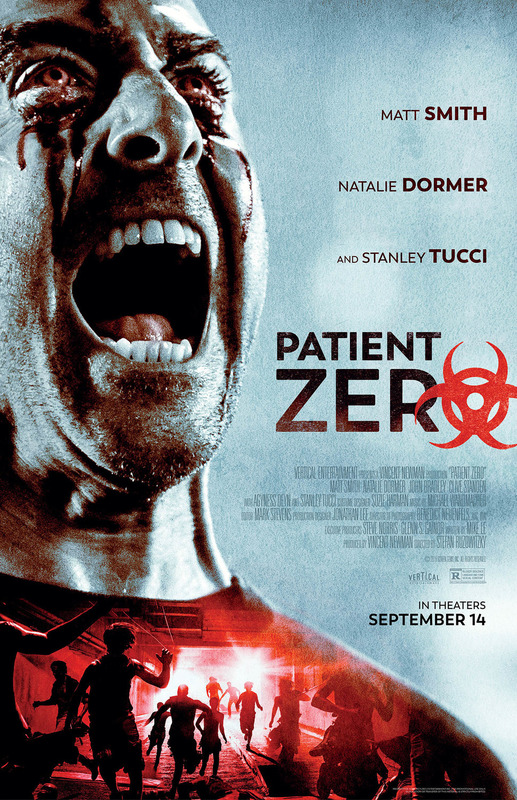 Patient Zero is currently in limited theatrical engagements nationwide. The closest venue to Los Angeles is the Galaxy Mission Grove Luxury, 121 East Alessandro Blvd., Riverside, CA 92508. The film is also available on VOD. Patient Zero has enough good moments for a short subject or a trailer, but the movie itself feels like an overlong rough cut of filmed rehearsals. Patient Zero: Copyright 2016: VOD release 10/8/2018; limited U.S. theatrical release 9/14/2018. 93 mins. Rated R. Directed by Stefan Ruzowitzky. Written by Mike Le. Cast: Matt Smith, Stanley Tucci, Natalie Dormer, Clive Standen, Agyness Deyn, John Bradley.